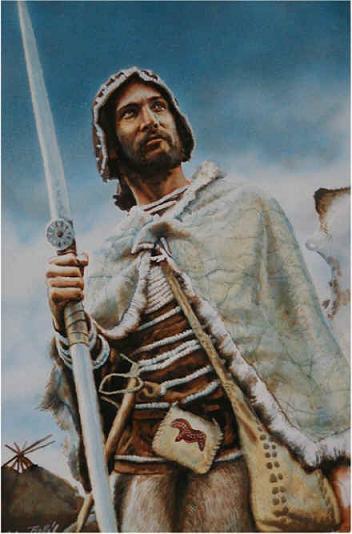 The image reconstruction idea of an Aurignacian men with equipment, based on the findings on the Mladeč locality. The Moravian findings come from the earlier Aurignacian and include different artefacts and human skulls. On the picture is a map of Europe with marked contour of the continent 35 000 years ago. Dash- dotted line shows the Pan-European Aurignacian culture, the white circles define archaeological localities – Hohlenstein (Germany) on the left, Mladeč (Moravian) on the right. It is possible that some Aurignacian localities appeared at the end of the era of the transitional cultures. (It is not clear who the bearers of the transitional cultures such as the Szeletian or Chatelperronian were, whether the modern people or the Neanderthals.) The rise of the first pan-European culture, which was carried by the modern Homo sapiens, begins with the Early Upper Palaeolithic (40,000–30,000 years ago). 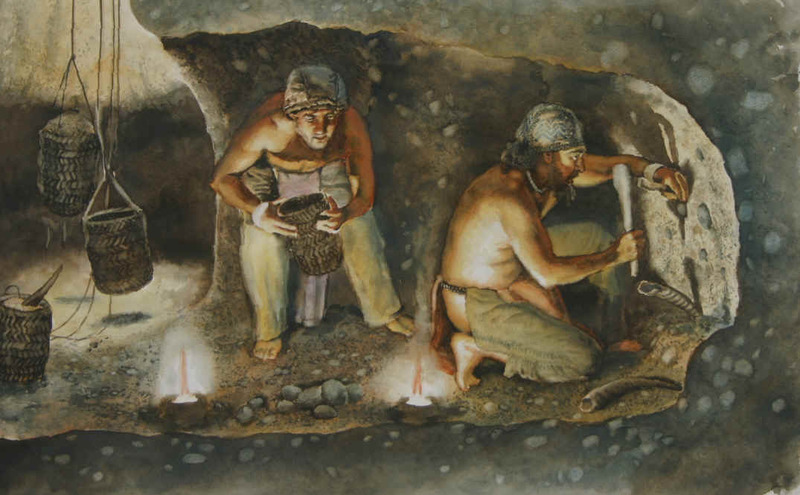 The findings of Moravia include both artefacts and bones (the Mladeč Cave, 33,000 years old). The recent research underscored the pivotal place of the Mladeč site for understanding of the emergence of modern Homo sapiens in Europe. There is only one locality in Europe where older remains of modern people than those of Mladeč were unearthed – bone fractions from Pestera cu Oase in Romania, about 35,000 years old. Nevertheless, the Mladeč cave yielded an assemblage of bones of 5 or 6 persons and, what is even more notable, Mladeč is now the only Aurignacian locality in Europe, where human remains are directly connected with the bone and stone tools, ornaments and other artefacts. A typical Aurignacian site is 35,000–30,000 years old. There are also some older or younger Aurignacian sites, but they are rare. The map of the Gravettian sites of Moravia and Austria shows that the Gravettian people disappeared from Central Moravia 23,000 years ago. At the same time, they started to be more influenced by eastern cultures (the Kostenki-Willendorf culture). It is possible to imagine that the reason was the existence of post-Aurignacian people, who came to Central Moravia, and thus the Gravettian people opened a new passage to the East. Nevertheless, the eastern orientation could be also explained by changes caused by progressive cooling before the last glacial maximum. The reconstructional metamorphosis shows the oldest demonstration of a mythological object and mythological being at the same time (cave Stadel-Höhel, Hohlenstein - Germany, more than 30,000 years old). One of the ways of interpreting this Aurignacien figure. First, there is no indication that the figure represents a woman. The figure may represent a bird-man or an Orante or a figure of a man holding his cloak high. It shows more than a simple figure in a particular gesture. On the hand we can see grooves, which may represent fringes, but also feather, and the back is decorated with areal geometrical decor. More precise identification of the statuette is impossible due to its heavy damage. However, the information for an Aurignacien person is clear nonetheless and it is similar to other Aurignecian materials such as decorating, which is centered on the arms, it reflects the anatomy of the body, and geometrisation of the square and the rectangle is applied here (the decoration is composed of imaginary rectangle and square networks). It is evident that they decorated even the naked body in Aurignacian. That corresponds with a warmer climate as opposed to the later Gravettien. The headwear does not have the same significance as it has in the Gravettien, either. The statue comes from the cave Geißenklösterle in Germany. The whistles (flutes) have been well preserved from the Aurignicien, and not just from bird bones, but also from mamoth tusk. Besides the excellent level of craftsmanship, we can observe a field otherwise difficult to preserve – music. Wood being more suitable, if it was used, such material is lost for archeology. Therefore, these bone instruments (bird bone, mammoth tusk) are of such an immense value. Locality cave Geißenklösterle - Germany. Aurignacian bone spikes from the Mladeč cave near Olomouc in Moravia. The spikes are in two sizes. The smaller ones could have been used both for throwers and bows, the big ones were used for spears. Similar bone spikes are known from other locations as well, but their shape is different (a cut out wedge). A spike in the wound probably served to damage the tissue via lever, created by the weight of the rest of the shaft. The surface of the spike indicates, that the missile was stabilized to minimize the contact with the ribs of the hunted-for target. Indication of the integration of an unknown artefact into a bigger complex (the Mladeč locality, Moravia). Possible ways of attaching the drilled tooth. (Mladeč locality, Moravia). These societies used to hunt for food, but gathering was also important for them. 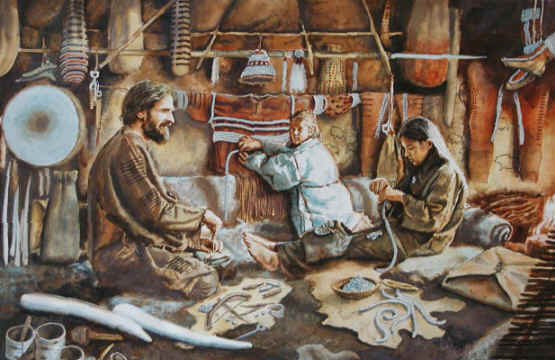 Hunting and gathering by the early cultures could earn a living even in difficult conditions after a few hours a day. Harmonious reconstructions of tiny-sized carving (sculpture) found in Austria (Galgenberg) represent two basic interpretations explaining possible positions of the displayed body. This statuette along with the man with raised arms on another Aurignacien plate suggests that the rules of displaying in this culture were not so restrictive as in the later Gravettian, where the statuettes would probably be more static. The older interpretation of the lady statuette was based on the association of the figure of a particular female dancer (Fany). However, it is not clear whether the countour line of the figure is authentic, i. e. whether parts of the left arm or the feet are not missing. The reconstruction is based on the assumption that the figure is complete. The ratio of the leg length to the trunk and the overall slenderness of the statuette indicates that the artist had on his/her mind a relatively slender lady with actual proportion ratios, which clearly contradicts the later Gravettian, where the legs (viewed from the front) would be much shorter because of the artificial displacement of the lap downward. Free live concept figures found in Austria figure is most similar relief resting women from La Madeleine in France. A reconstructive transformation of a resting woman from a relief, La Madeleine locality, France. (Added just for comparison, the age of the relief is unknown). One of the oldest portrayal of a woman´s figure (Hohle Fels - Germany). The uniqueness of this statuette is in the fact that it bears clear signs of an Aurignacian person. 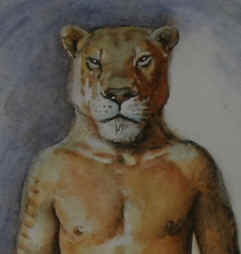 Just like the lion man, it has decorated arms and other body parts. Besides the possible plastic tattooo or body painting, we can see decorations with a body belt and perhaps even bracelets on the elbows. The statuette is suspended, its head serves as an eyelet and there is an emphasis on the identification of the gender. In comparison with the Gravettien, where decoration with body belts dominates, bare skin is decorated here, which only makes sense if the body is exposed for a significant amount of time, which corresponds with the climate. Aurignacien people could thus keep some parts of their bodies exposed during certain times of the year. Because of the fact that there are accidentally digged out and preserved so few statuettes having the same decorated arms, logic makes us assume that this is a repetitive type of decoration, characteristic for Aurignacien. We can also assume that statistically it will be the geometrical decorating that will be the most significant among future discoveries. A figure of a lion-man in the hands of its author. 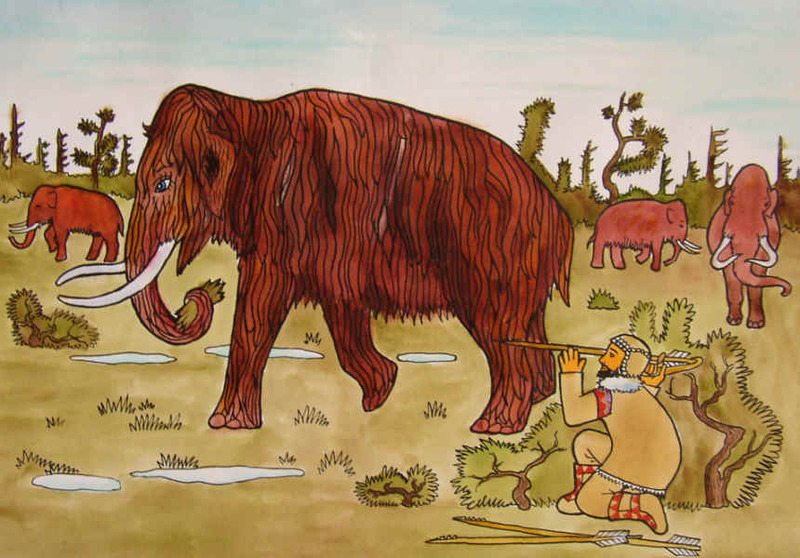 The free idea shows the raw material of which the figure was made – mammoth tusk. The type of the man and the color of his skin does not have Nordic characteristics. This Modern man had not lived in the typical glacial conditions in Europe yet, which is why he was able to keep his dark skin inherited from his African ancestors. But he also might have had fair skin because the North of Africa was settled by white population in the prehistoric period. He can be imagined as a sun-tanned Spaniard. Climatic conditions of Aurignacien were similar to the conditions of today´s Central Europe. We can clearly see the decorations on the anthropomorphic figures which respond to the anatomy of the body or the shape of the object; therefore we can count not only with bodypainting, but also with decoration of clothing. The magician´s shelter; another picture of a man creating the statue of a lion-men. We can also see the ethnographical artefacts, attributes and utilities of the shaman. Some 38,000–35,000 years ago, the first real stone mines appeared in Egypt (Nazlet Khater). Deep holes were dug up, sand and gravel were removed and raw stones were excavated from the bottom, where a large round space with a ledge emerged. The raw material was extracted through the central shaft. Pits that ran horizontally into a gentle hill slope were then dug from inside. Stones suitable for shaping were rare in the gravel or sand, and that is why mines appeared. Mines were quite common in the Palaeolithic. It is even possible that some of them were made by the Neanderthals (the Tata locality in Hungary).